Sign up for free and just shop with Vitabiotics as normal. Our average member earns over £300 cashback a year. Vitabiotics cashback can be earned simply by clicking through to the merchant and shopping as normal. Vitabiotics Cashback is available through TopCashback on genuine, tracked transactions completed immediately and wholly online. Lead a healthy lifestyle thanks to an extensive range of quality nutrition products and make great savings with our Vitabiotics promo code and cashback deals when you sign up to TopCashback using the form at the bottom of this page. Whether you are looking for vitamins, such as Ultra Vit B Complex, which contains all eight essential B vitamins, including B12, women's health products, diet aids or beauty products, or want the latest sports fitness supplement, they stock items produced using the latest science from leading brands. Vitabiotics offer free UK delivery with most items, while you can save 20% when you subscribe to a particular product. Sign up to their monthly newsletter to receive the latest news, offers and giveaways, while you can make use of a range of health tools, including body mass index and pregnancy due date calculators. Whatever your needs or concerns, Vitabiotics sell products which are at the forefront of scientific developments and which will improve your health and wellbeing. Purchase Wellwoman and Pregnacare supplements - which include iron - to boost your immune system function or folic acid and other essential minerals to help your growing baby during pregnancy. The range also features food supplements for men, such as Wellman Original, which offers a formulation of 29 essential bio-elements in each tablet, while you can also get your hands on Wellman whey protein. When it comes to healthy living, you will also find glucosamine for your joints and bones by brands like Jointace and Osteocare, while their Ultra Calcium and Ultra Magnesium will help maintain your teeth. Hairfollic, which contains zinc, biotin and selenium, will help maintain normal hair, while they stock fish oils and Omega-3 tablets if you are looking to improve your heart health, including Ultra Cod Liver Oil, which provides a natural source of vitamin D. Whatever your concern, you can purchase everything from herbal remedies such as echinacea to men's grooming products and energy drinks, while there are specific products for children and teens which will provide them with essential nutrients. Vitabiotics was founded in 1971 by Dr Kartar Lalvani OBE, with the first product launched being Oralcer, the patented and licensed mouth ulcer treatment. The 1970s also saw the launch of Omega-H3, which was the first true comprehensive multivitamin. In the 1980s, the vitamin company established international manufacturing facilities and invested in research which paved the way for brands like Pregnacare, Osteocare and Menopace. The following decade saw professor Arnold Beckett OBE appointed chairman, brands such as Wellman and Wellwoman launched and Vitabiotics celebrate their 25th anniversary at the House of Commons, while by this time, the brand was available in 65 countries worldwide. In 2003, they were awarded the prestigious Queen's Award for International Trade, which they received again five years later. The first decade of the century also saw Vitabiotics extend their export activity to more than 100 countries and become the UK's second largest branded multivitamin manufacturer. They celebrated their 40th anniversary in 2011 and later in the decade launched their licensed traditional herbal medicine range, while 2013 saw them become the first British company to receive the Queen's Award for Innovation in vitamin research. Subscribe to a particular Vitabiotics product and you will be able to save 20%. On the vitamin or food supplement product page, just click the Subscribe button and choose the amount you want to receive each month before checking out as normal. You will need to have a Vitabiotics account and if you do not have one, you will be prompted to create one during the payment process. As well as ensuring you will never run out of your favourite products and making great savings, you will also earn reward points. Your chosen products will be sent once a month, while if there happens to be a special offer which means customers will receive a free gift when they purchase your product, you will get it too. You can amend or cancel Subscribe & Save orders, but this must be done before 10am on the dispatch date, which can be found within that section of your online account. As well as offering free delivery with most items, there are other ways in which you can save money when shopping with Vitabiotics. 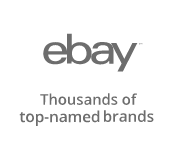 You will sometimes find three for two offers, which will give you the lowest priced item for free. All you will need to do to take advantage of such a deal is choose at least three full priced items. A maximum of 10 free products can be given with this offer with any one order (meaning you will have bought 30 items in total). This deal cannot be used in conjunction with any other offer, while you will not be able to earn reward points on the free product in the three for two deal. When shopping on the Vitabiotics website, you will earn reward points, which you will be able to use to get money off future orders. A hundred points are equal to £1, while your final order value must be a minimum of £1 after the value of the points has been deducted. When placing an order, any points you are entitled to will be added to your account once it has been shipped. 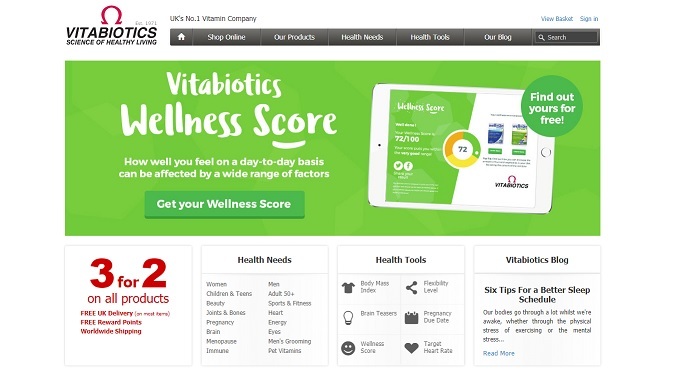 The Vitabiotics website offers various health tools to help you look after yourself. Their range of health calculators include a body mass index tool which will tell you if you are underweight, overweight or obese based on your weight and height, an exercise you can use to check your flexibility level and a pregnancy due date calculator, while you will also be able to discover what your target heart rate should be depending on your age. This will help you measure intensity during aerobic exercise, with many experts recommending that healthy adults exercise at 60% to 80% of their maximum heart rate. You will also find health quizzes which will test your brain or come up with your wellness score. Finally, you can use their supplement selector to choose the right product for you, depending on whether you are looking at your general health and wellbeing or have a specific health interest. Vitabiotics offer free UK delivery on most items, with the exception of liquid and powder products. 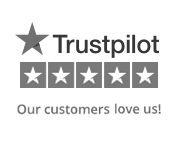 Their free standard delivery service will see your items arrive in 3-5 working days. However, if you need your order a little quicker, their express delivery service will get them to you in 1-2 working days, while their standard parcel service will see items arrive in 2-3 working days. These timescales are based on orders placed before 1pm Monday-Friday for items which are in stock, while they will not dispatch items on Bank Holidays. If you are not in to receive your parcel, they may leave a card asking you to collect it from your local Royal Mail sorting office. Alternatively, you can arrange for it to be delivered to your work address if you know no-one will be at home. Improve your wellbeing and get your hands on a healthy slice of cashback with these great offers. Vitabiotics manufacture innovative healthcare solutions and have created a unique portfolio of products at the forefront of scientific developments in key sectors, including nutrition and women's health. Shop for vitamins, cranberry, glucosamine and magnesium, as well as Omega-3, cod liver oil and krill oil. You will also find herbal remedies like echinecea and St John's Wort, and big brands such as Wellman and Wellwoman, Osteocare and Feroglobin.